A study of how people move through and interact with a multi-purposed space. An observational approach yields an understanding of natural movements in the space without intervening. Then, focusing on the unique pain points, i.e where congestion occurs, or it gets to loud to focus on your work. 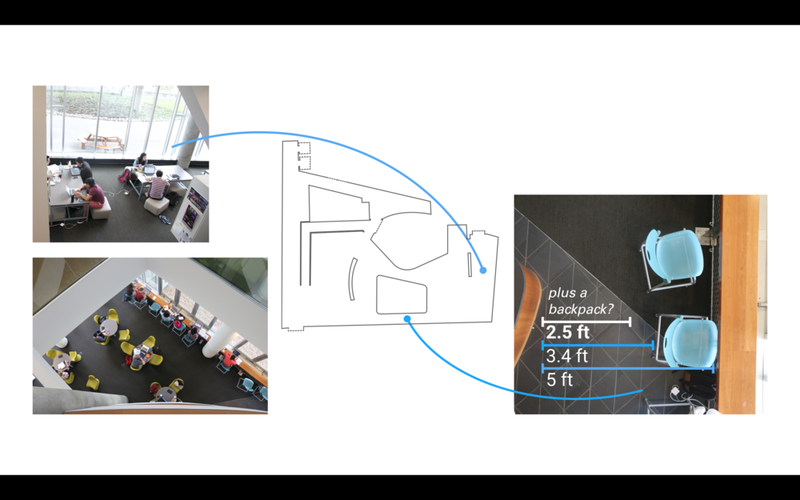 We make categories for the different types of spaces based off of furniture type and noise level and go from there to the users of the spaces. The third floor of the Gates Hillman Computer Science building at CMU has a cafe and many areas for students to work and collaborate with peers. Since it is so welcoming of an environment, it attracts a large student and faculty body, and therefore it occasionally becomes cumbersome to move through the space easily: chairs in your way; crowds of people standing around seated, focused students. It can get a little cramped. Students move and work through the space in these patterns depicted to the right. The arrow groupings show how a student may move through the space and not stay, and also how they may settle down in the environment. Since it is at the ground level (third floor is the ground level) of a highly functioning building, many students interact with the 'Cafe in Gates'. It's a student hub and relaxing place to take a break. Yes, it is busy, and yes, it is flawed. It becomes congested, and the areas are roughly defined if at all. Talking to the students in the area, we find that the spaces can have totally different uses and that's ok, but what we find is that there are some areas that have pain points, and that if addressed, the flow of people would be greatly lubricated. As is, there is barely enough room for one person sitting while hanging there backpack on their chair. We see a lot of congestion in this area during the busy hours of the afternoon. To make a beneficial change to the space, we propose that the line change which side it is on. This would give the students sitting by the window more peace and take away much of the distracting noise from the students in line. We find the best way to remove congestion would be to move the entire cafe station into the computer cluster and create a welcoming cafe seating area where the cafe currently is. That would be the ideal improvement to the flow of the space, though we recognize the large structural changes that would need to occur.